I was recently inspired by the Rialto Jean Project, created by Erin Feniger (go read up about her. She's awesome!). 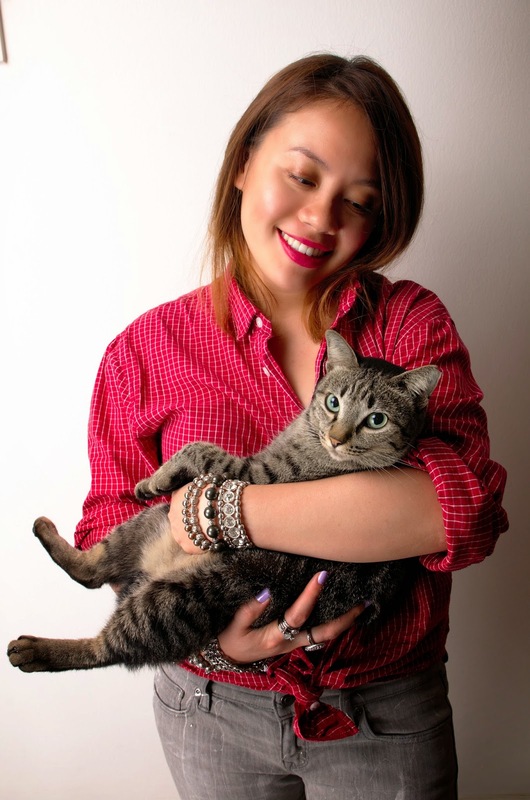 Using vintage Levi's, Wrangler and Lee jeans, Erin hand paints denim and turns them into wonderful one-of-a-kind denim. I loved each and every one of them so much I decided to create a version of my own. 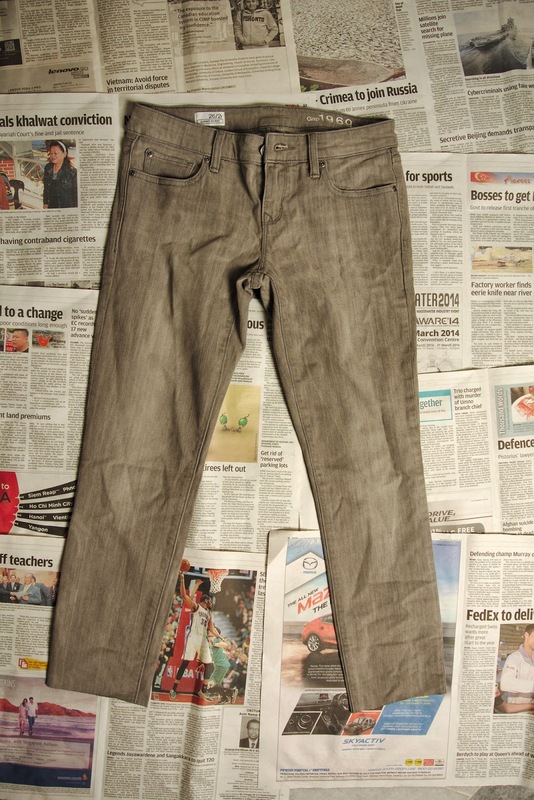 This is a good way to create washed-out jeans, without having to use bleach. 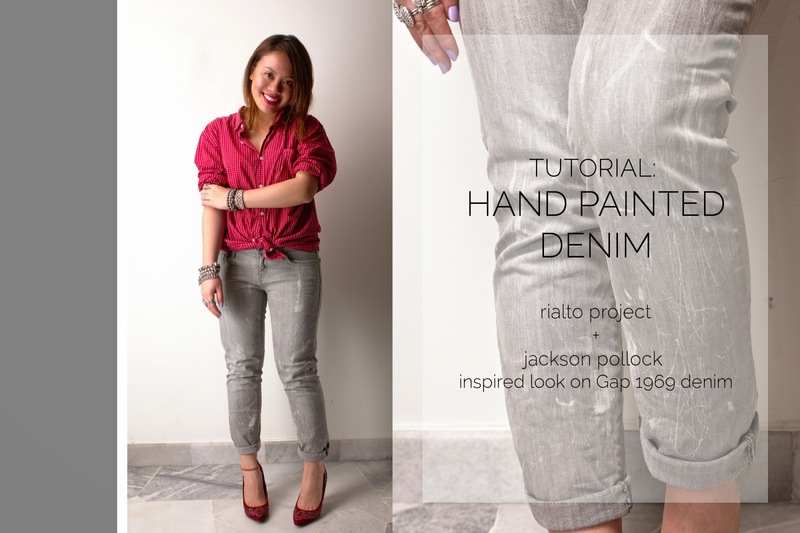 This is similar to the watercolour pant I created earlier (tutorial HERE), except this is easier! 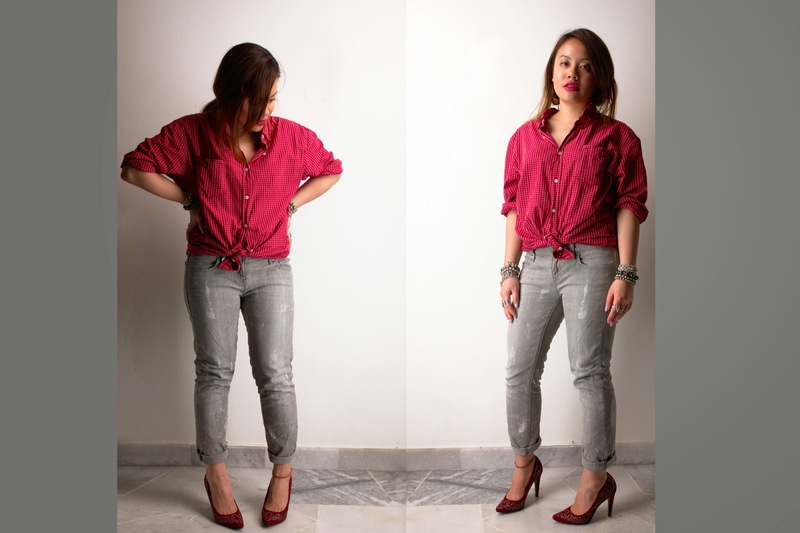 More photos of painted pants for inspiration HERE. This version is an understated version, I plan to create another, similarly as bold as Erin's! 1. 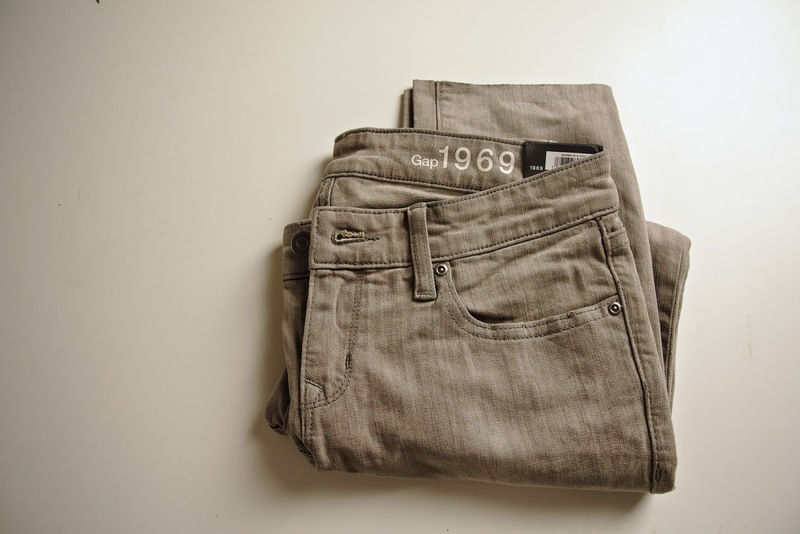 I had a pair of Gap 1969 jeans that needed a little makeover. It had a small stain on the back of the pant. I made sure the pants fit the way I wanted it to - cut off hem etc. 2. I laid my jeans flat on the floor (over newspaper actually), focusing on the front first. 3. 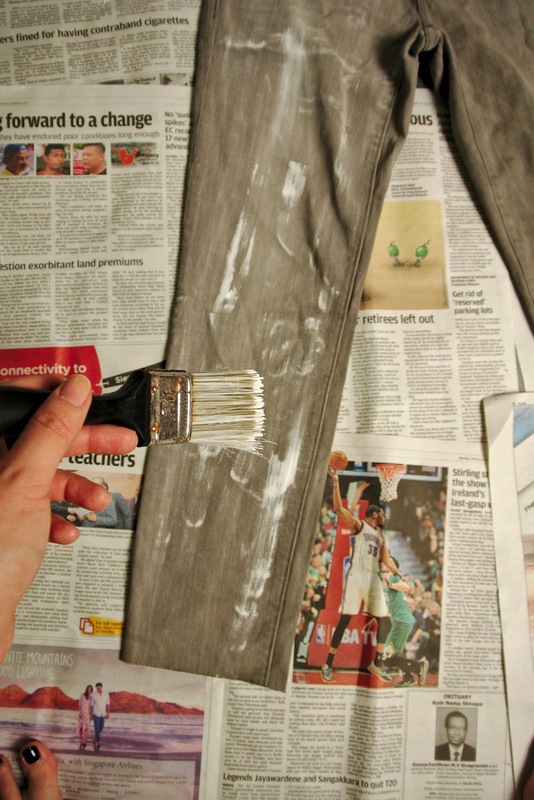 With the bigger brush, dab bits of paint all over your jean. This step is to create the bigger 'stains' on the jean. 4. 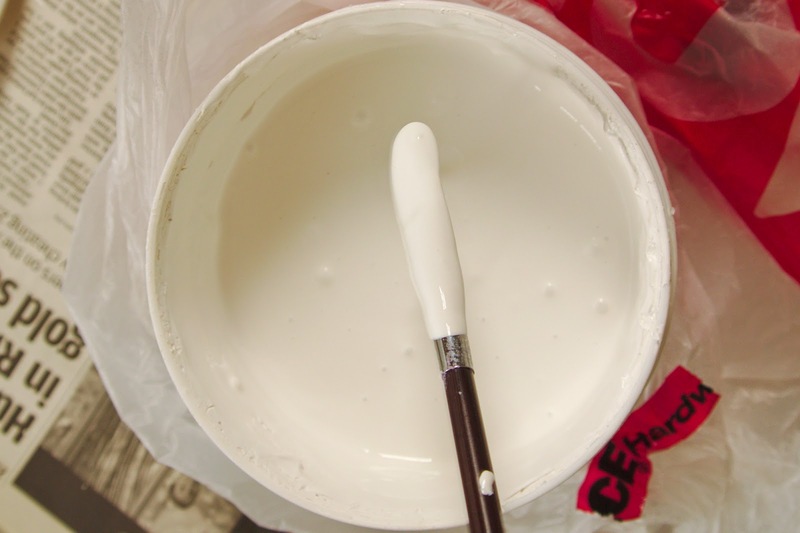 With the smaller brush, I dipped half of it into the tub of paint. I wanted to accumulate as much paint as possible on the brush. 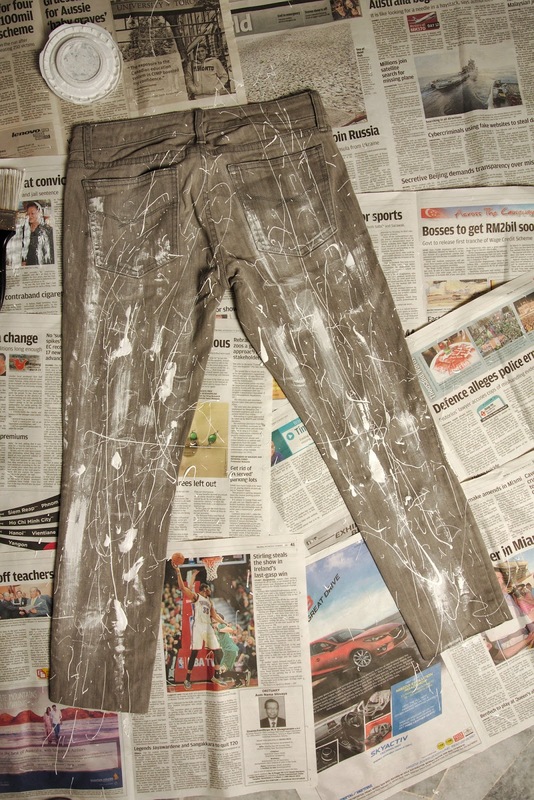 I then very quickly let the paint drip all over the jean, creating Jackson Pollock inspired art. I moved my hands quite quickly so that I didn't get clumps of wet paint on one spot. The sky is the limit. Use as much (or as little) paint as you want. Go bonkers, get creative! 5. Let the layer of paint dry, this will take a couple of hours, before replicating steps 3 and 4 on the other side. 6. Since I was headed towards creating an understated version, I let mine dry for about 5 hours before dumping it into the machine. 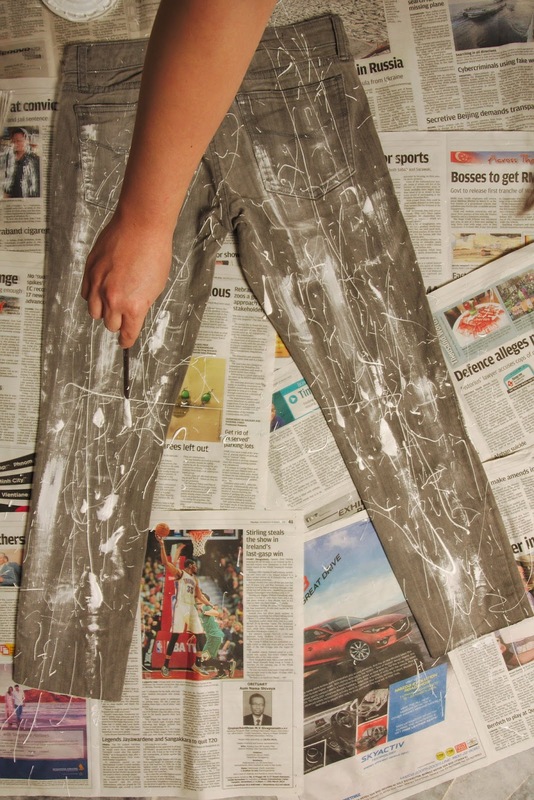 This way, most of the chunky bits of paint would fall off, leaving behind only a wash of white stains on the denim. 7. If you like it bold and loud, use ACRYLIC paint (I love the Martha Stewart range, example HERE) instead. Let dry overnight and iron over your denim before washing it. Remember to lay an old piece of cloth over the painted denim before ironing, in case the paints rubs off etc. 8. You could also use multiple colours like Erin did! I hope you liked the tutorial. Let me know what you think or share your creations with me! Random photo of this very cute cat who goes by the name of Lizzie, short for Queen Elizabeth (because she's the queen of the lorong, duh). Rialto Project images from here.